Home » Vintage catalogs » Kitchens » Happy 10th birthday, Retro Renovation! 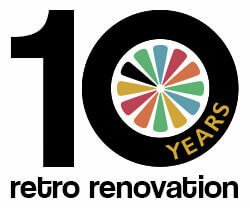 Happy 10th birthday, Retro Renovation! Yup, today is the 10th birthday of the blog. My first story was, predictably, about a toilet. Over the next few days and weeks, I’ll be doing some looks back. But for today, well, I’m gonna think about everything. And hey, I’ll welcome some well wishes! I’m a little (way) late to the party, but congrats/happy birthday, Pam and Retrorenovation from a longtime reader and fan!! I can’t even tell you how valuable your website has been to me, as a resource for refurbishing my 76 year old house, as compelling food for thought, and as good old-fashioned entertainment! Pam, your writing is such a joy to read, and I have learned so much from your tireless, sometimes crazy and always fascinating, research: from hudee rings to tesselated VCT patterns, and amber shellac to mudcaps!! I thoroughly enjoyed Kate’s thoughtful in-depth contibutions, as well. (Whoo, Kate!) Her careful, step-by-step documenting of her heroic bathroom remodel was absolutely epic, no joke! I’m in awe! One aspect I particularly enjoy here are your ‘bigger picture’ essays that spell out why it’s important, from an environmental as well as economical amd aesthetic perspective, to learn to ‘love the house you’re in’ and approach renovations with an eye toward preserving the overall harmony of the house, using older, or better quality, materials (when safe), instead of supporting the vast home improvement racket that seeks to brainwash us into viewing everything as disposable and the TV shows that try to con us into feeling inferior for not being up-to-the-minute in the latest trends. Ugh. I’m also thinking of your excellent post about original windows and the vinyl replacement window industry. What a disservice they have done by defacing countless buildings across the nation, never to be the same again! Pam, I truly believe you have been a leading voice helping to usher in a new era where average people everywhere are starting to appreciate the better quality of yesteryear compared to the terribly cheap but expensive materials, furniture, and appliances made today (and all the waste associated with them). I guess it took all us kooks’ favorite aesthetic becoming the new hot trendy thing, but whatever it takes to stop the house flippers with their sledgehammers and granite and greige! I may be overly optimistic, but I’m feeling a change happening on this front. Annnyway…just wanted to say many thanks and congratulations, again! !